Education World has 180 quotes for you. That's one per school day! Mathematical Quotations - For those of you who believe, as did Sim?on Poisson, "Life is good for only two things, discovering mathematics and teaching mathematics"
Reel Life Quotes - "your life is a movie" and you are its director and star character. Incorporate an inspirational movie quote into your classroom. Quote of the Day - a daily quotation to you in your e-mail every day, or read it online. A Quotation a Day: Just What the Language Doctor Ordered! 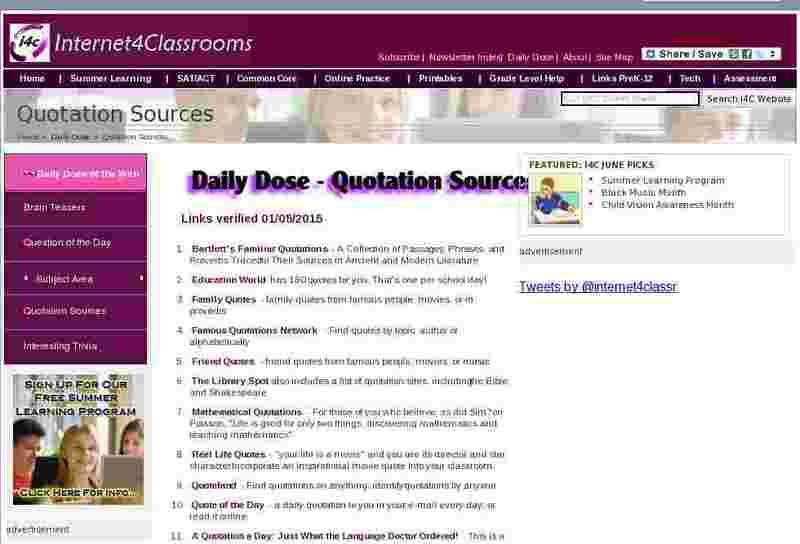 This is a great article from Education World on using quotes in your classroom activities. Quotations Home Page - This one is one of the oldest and largest on the Web. The associated poetry site is the largest private archive of its kind on the Web. Be sure to check out their Quote A Day calendar for daily quotes.